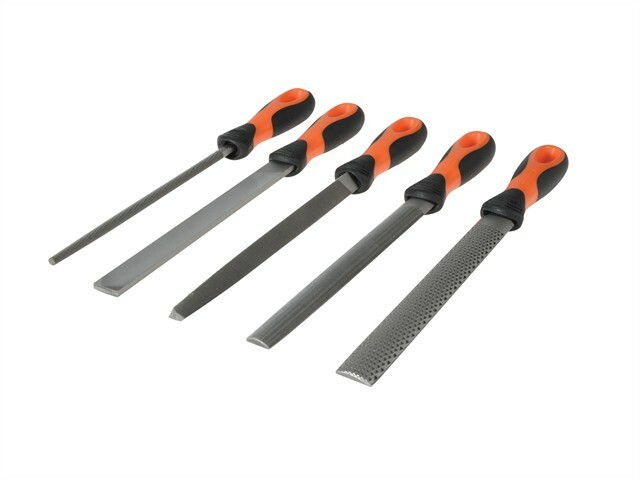 Bahco File Set 5 Piece, Engineer's 8in file set, all are fitted with ERGO™ handles for comfort. 1 x 100-08-02 flat second cut file. 1 x 170-08-02 triangular second cut file. 1 x 210-08-02 half round second cut file. 1 x 230-08-02 round second cut file. 1 x 343-08-02 half round rasp. Supplied in a plastic roll wrap.